Cultivate your own live butterflies from caterpillars. This is a beautiful way to see nature at its finest! Observe as the eggs grow into caterpillars and how the caterpillars metamorphose into beautiful butterflies. 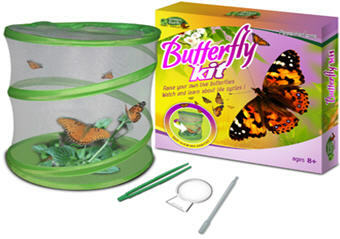 This fascinating habitat kit is ideal for classrooms. Instruction book with information and activities about the Cabbage White Butterfly "Pieris Brassica"
The World Alive Butterfly kit includes: Habitat, water dropper, magnifier, tweezers with padded tips, activity and instruction book plus an order form to buy your live caterpillar eggs. the sheddings is called an instar. The later instars (when the caterpillars reached a size of approximately 2 cm) are highly photosensitive. At this period the larvae need light for 16 hours a day. If the light period does not reach 16 hours the pupal stage will go into dormancy and continue the development just after a few months. After about three weeks, the caterpillar stops growing at almost 5cm long. Butterfly larvae breath through tiny holes on each side of the first segment in their thorax and the first 8 segments of their abdomen. Their first 3 pairs of legs are jointed and become legs of the adult butterfly. The back legs are called "prolegs" which means false legs, and these disappear in the chrysalis. first spins a silk pad around the body. Within the next hours the caterpillar produces more and more silk. After approximately 12 hours the body of the larvae changes into the pupae. Within the pupal stage, the metamorphosis of the butterfly takes place. which may be as long as the half their body length. This proboscis works like a straw. To drink they put the proboscis into water and for feeding they use nectar solution.